Visit Universal Studios CA, the popular theme Park in Hollywood California. Located in world-famous Hollywood, this park offers tours, rides and fun Hollywood style. The Wizarding World of Harry Potter is now part of Universal Studios Hollywood. Universal Studios is both a theme park and a Hollywood movie studio. It is located about 45 minutes from Disneyland California, and 2 hours from San Diego. If you love theme parks, a visit to Southern California should include a day at Universal Studios Theme Park. Don't miss my favorite shows - the new LA Wizarding World of Harry Potter World, and WaterWorld, an elaborate and wild water stunt and pyrotechnic show (see photo above), and of course, the King Kong exhibit. The Wizarding World of Harry Potter including Harry Potter and the Forbidden Journey, and Flight of the Hippogriff. You can also meet your favorite characters like SpongeBob SquarePants and Shrek. The LA Wizarding World of Harry Potter opened in 2016 at Universal Studios CA. The Los Angeles Harry Potter theme park is modeled after the famous Harry Potter series, and the successful Wizarding World of Harry Potter at Universal Studios in Orlando, FL. The Universal Studios tour is free with your admission to Universal Studios LA. Also don't miss the Universal Studio Special Effects Stage to give you insights into those Hollywood special effects, sure to dazzle you. The VIP Experience tour costs extra, but gives you plenty to see back stage. You have a personal studio guide, get to walk around in the backlot, and see sets from your favorite shows. Reservations are strongly recommended as space is limited. 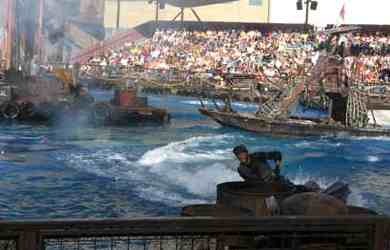 This Hollywood style theme park in Southern California has studio tours, rides, shows and food. Universal Studios Hours: Vary from 10 - 5 off-season weekdays to 8 AM - 10 PM summer weekends. Hours vary each day. Early Admission - If you purchase a preferred hotel package from Universal Studios online, you can get 1 hour early admission to The Wizarding World of Harry Potter. Parking: $25.00 is typical, RVs pay extra. After 6 PM, parking is only $10. Food: One of the nice things about this SoCal theme park is CityWalk, a collection of fun restaurants in a Hollywood California setting open during the day and for several hours after the park closes. Stay for a late dinner after your day at Universal Studios LA! Universal Studios Halloween Horror Nights offer the scariest Halloween event in Southern California. Open late September - October on select nights only. No costumes allowed as you wouldn't want to upset any monsters with chainsaws. Grinchmas happens every winter at Universal Studios, where the Grinch himself can be seen at Whoville. Universal Studios CityWalk is located just outside Universal Studios, as you walk from the parking lots to the theme park. Citywalk has restaurants, clubs, IMAX theater, shops, live music and lots of fun to get you into the Hollywood spirit. You can exit the park for a nice meal, or stay later in the evening after the park closes and enjoy an evening of food and entertainment. Admission to the theme park is not required to visit CityWalk. Don't worry, you don't have to drive across this bridge to get there! It's just part of the studio tour.